beautiful finished products. It is used to make perfect book covers, cover of notebook, calendars, hanging calendars, files etc. 1. The feeder adopts back-push feeding system, which is controlled pneumatically, and its structure is simple and reasonable. 2. The width between stacker and feeding table is adjusted concentrically in the centre. The operation is very easy without tolerance. 3. New designed copper scraper cooperates with the rubber more compactly, effectively avoiding paper winding. And the copper scraper is more durable. 4. Adopt imported ultrasonic paper tester device, featuring in simple operation, to keep two pieces paper from entering into the machine at the same time. 5. The cardboard feeder is controlled by linear guide line and servo motor, its location is correct and quick. 6. In the cardboard feeder, the machine can automatically stop when lack of cardboad to reduce the waste. 7. With a power-full sucker motor to keep the paper without any movement. 8. 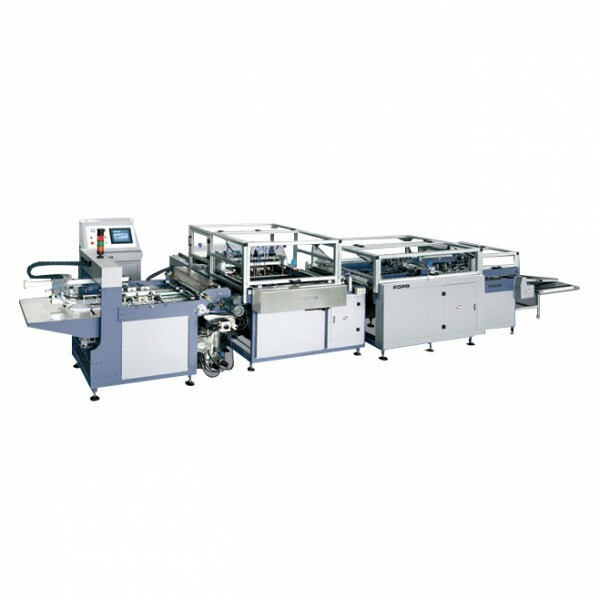 Paper feeding and positioning system adopt imported high-precise photoelectric control device to make the paper and cardboard location more accurate. 9. The folding unit adopts special automatic angle-repair, edge-repair to ensure the qualification of finished products. 10. It adopts PLC control, featuring in simple operation. The troubles are displayed directly on the HMI, which helps the operator easily remove them. 11. Optional device: glue viscosity meter. 1.The max and min sizes of the covers ard subjected to those of the paper and the quality of the paper. 2.The production capacity is 25 cover per minute.But the speed of the machine depends on the sizes of the covers. 3.We don't provide air compressor. Wenzhou Zhengrun Machinery Co.,ltd, established in July 1997 has more than ten years’ history.Our company integrates research, development, industry and trade. It has standard factory 22,000 square meters, 170 employees and 11 sets CNC. We have rights of self-managed import and export. Our company has been admitted to ISO9001 Quality Management System Certificate. The products have been admitted to Europe CE Certificate. Our products have been exported to Europe, America, South Africa, the Middle East and the Southeast Asia, more than fifty countries and regions. There are an agency networks all over the world.